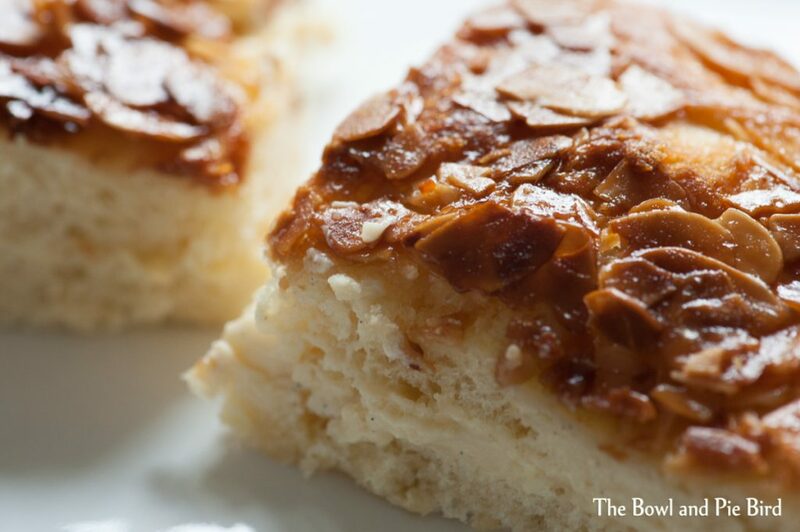 “Bienenstich” is a German cake made of a sweet yeast dough with a baked-on topping of caramelized almonds and filled with a vanilla custard, buttercream or sometimes just whipped cream. I found the translation “Bee-sting cake”, but must admit that the translation is way too literal for me and I don’t think I would use it. But maybe in the baking world it is familiar? I love this cake, but haven’t bought it in years as I just don’t like the versions they sell in the bakeries anymore. The custard tastes too artificial, the dough isn’t yeasty enough and the tasty topping is used very sparingly. But baked at home this cake is an absolute delight! While looking through my recipes the other day I noticed that I hadn’t transferred this recipe from my Facebook page to my blog. So definitely time to do this now even if the photos are from 2014. After all, classics don’t age. And writing about this tasty cake has made me want to bake it again soon. As I hadn’t made a yeast dough in ages I found the recipe from the German magazine Für Sie. The video tutorial I found very useful. I used the recipe for the topping from here as well. As I didn’t want to make the filling using custard powder but wanted to give the real thing a go I searched the internet for a while to find the name for it: Crème Pâtissière. I found a good recipe at Lekkertipps. Four years and many cakes later I know now that this is actually just ye normal old pudding recipe like the one used for German buttercream. But each profession uses its own terms and Crème Pâtissière does sound much nicer than pudding. This entry was posted in Cakes and tagged Bee-sting cake, Bienenstich.